The Lady Bulldog basketball team put forth a hard-fought effort Saturday in the City of Champions Classic title game, but the girls in orange could simply not keep pace with Carlsbad. The Cavegirls came out dominant and finished the same way in a 57-22 win over Artesia. A 12-0 start by the girls in blue dug an early hole the Lady ‘Dogs – who shot just 17 percent from the field on the night – could not clamber out of. Still, the contest was not without its bright spots. The Artesia girls never let up, forcing 15 Carlsbad turnovers with their quick, physical defense while limiting their own turnovers to 14, seven in each half. 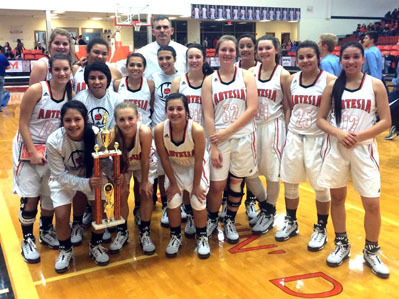 to be a great learning experience for us,” Artesia head coach Jeff Houghtaling said following the game. “I think we’re going to be able to do a lot of good things by looking at that tape and talking about it – learn to be a little more physical, use angles a little better, anticipate. No sooner was the ball tipped than the Cavegirls were on top Saturday, as Carlsbad’s Carryn Boswell knocked down two quick treys with a offensive putback by Rylan Gonsalez between. By the time the Lady ‘Dogs managed their first field goal with 2:57 to go in the first, the Cavegirls had tacked on seven more, including another Boswell longball, to lead 15-3. Gracie Tesillo helped Artesia to its highest-scoring quarter of the night with a late running jumper and an old-fashioned three-point play to make it 20-8 going into the second, but the Lady ‘Dogs’ shooting woes would continue from there. Despite limiting Carlsbad to nine points in the second quarter with help from six turnovers, Artesia would log just a pair of baskets of their own on a breakaway layup off the Alissa Wagner steal by Tesillo and a drive in the paint by Paityn Houghtaling with 2:10 to go in the half. “We missed a bunch of shots, but I thought we got some good looks,” Coach Houghtaling said. “We got the ball in the right spot most of the night, we just didn’t take advantage of some easy shots. Down 29-13 going into the final quarters, a basket with 50 seconds left in the period by Alexa Riggs and a pair from the free-throw line by Tesillo would comprise the Lady Bulldogs’ scoring in the third, and a Chelsea Evans bucket marked Artesia’s lone field goal in the fourth. Carlsbad, meanwhile, closed out the contest with a 16-point fourth that included two more three-pointers by Jensen Leivo and Mariel Gomez. Tesillo led the Lady ‘Dogs with 10 points on the night, followed by Houghtaling with four. Boswell finished with 17 for the Cavegirls and Gonsalez 10. With the runner-up finish in their home tournament, the Lady Bulldogs moved to 3-3 on the season after quality wins in the opening rounds over El Paso Bowie and Santa Teresa. “I thought this was a good tournament for us,” said Houghtaling. “It’s always good to say in the winners’ bracket and advance to the final game in your home tournament. We haven’t done that the last couple of years, so we’re excited to get back going in that direction. Representing Artesia on the All-Tournament Team were Wagner and Tesillo. The Lady Bulldogs will now have a few days off before heading into another weekend of quality basketball Dec. 18 and 19 as they host Belen and Los Alamos at 7 and 3:30 p.m. respectively. “We’re excited to get to play those northern 5A teams,” Houghtaling said. “I really feel like we have one of the best schedules in 5A because we have opportunities to play teams in our class from all over the state, and if we take advantage of them, it can certainly help us in the seeding and selection process down the road. Houghtaling was also grateful for the support the team received and the generosity of local businesses and organizations who helped make the 18th annual City of Champs a success. “We want to thank our sponsors,” said the coach. “Tate Branch Dodge as a title sponsor took care of hotel rooms for teams, fed all the teams. We had a fantastic cookout yesterday – Halliburton came out and grilled burgers and hot dogs all day, and the Chamber of Commerce and Lodger’s Tax provided the programs, meals at Henry’s and Pecos Diamond. As predicted by head coach Jeff Houghtaling prior to the second meeting of the season between the Lady Bulldogs and Santa Teresa, the Lady Desert Warriors came out with revenge on their minds Friday in the semifinal round of the City of Champs. The Warriors fought the Lady ‘Dogs blow for blow in a low-scoring but physical first quarter. Frenetic defense by both squads resulted in nine Santa T. turnovers and six by Artesia as the teams vied for the upper hand. Alissa Wagner got things started with a three-pointer for the Lady ‘Dogs and a Paityn Houghtaling offensive putback gave them a 5-2 edge, but the Lady Warriors would reel off seven unanswered to take a 9-5 lead. With under a minute to go in the first, however, a shot off the glass by Wagner off the assist from Shyann Spence and a breakaway layup off the steal by Gracie Tesillo allowed Artesia to know the game at nine-all going into the second. There, the Lady Bulldog posts went to work, with Spence posting six points and Tori Collins four en route to a 10-point advantage at the break, 23-13. The Lady ‘Dogs were able to maintain that margin through the third quarter with help from a pair of baskets by Wagner, a Gracie Puentes layup, and a NBA-range three at the buzzer by Tesillo. 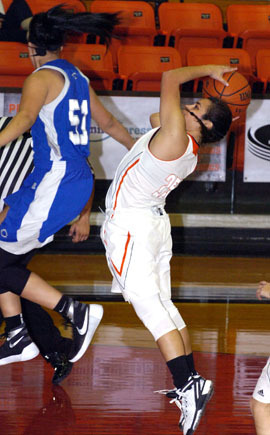 Artesia then took advantage of eight Warrior turnovers to limit Santa Teresa’s scoring and pull away in the fourth on four points each by Puentes and Stacia Martinez. Wagner finished with nine for the Lady ‘Dogs, followed by Puentes and Spence with six each.